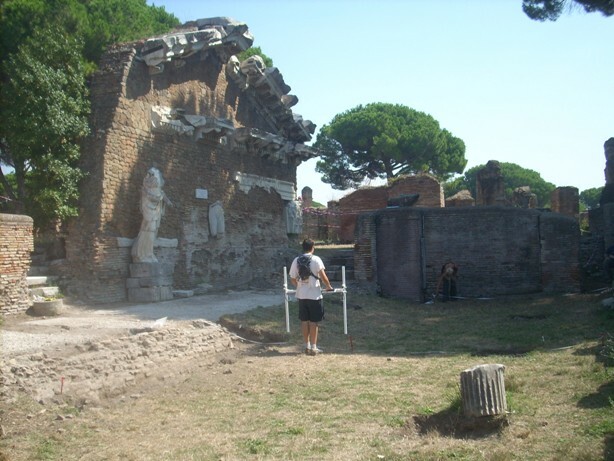 Today we have finished cleaning the palaestra entrance, where two phases of late Roman monumental entry can be seen. Thanks to some rough early excavation trenches we have the chance to view the stratigraphy in this area. 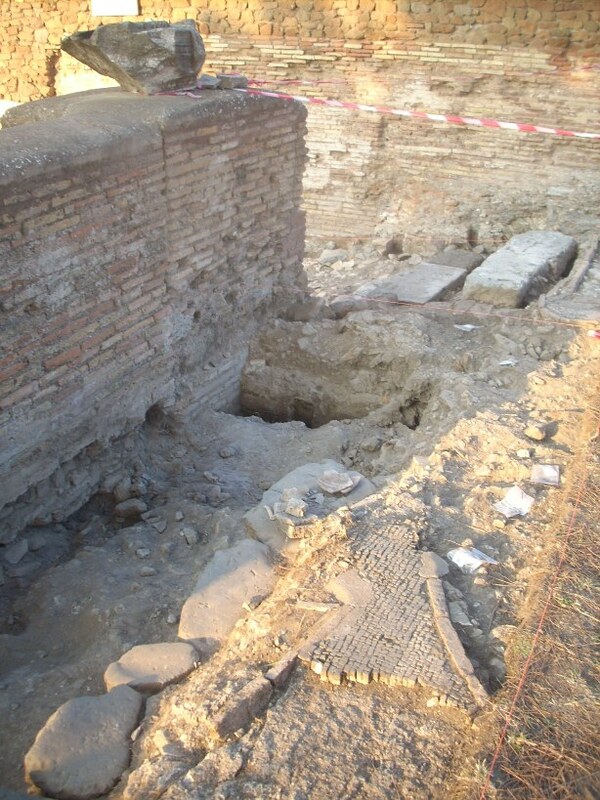 There are at least two clear levels visible where the level of the paving has been raised: once in association with the blocking of the monumental arch leading from the carod to the forum (a level of mortar carrying basalt paving), and a second associated with the establishment of the monumental entrance of the palestra (tiles,mortar then a mosaic). It looks likely that Sebastian’s team will be able to date these levels and make sense of the general redevelopments of the area. Back in the Palaestra Ana is continuing to make observations on the small temple. She has identified part of the cornice of the structure and has comprehensively mapped the multicoloured marbles of the opus sectile paving. We have also established that the great white mosaic of the palaestra laps over the top of the temple phase of the re-used structure, meaning that we have a grand urban scheme even after major late redevelopments took place in this square. In front of the arch, in the main forum, Doug Underwood and Bonnie Knapp have completed a mangetometer suruvey. This, along with the great site drawings of Jo Measor and Tina Manahai will allow us the better plan the final days of excavation in this area. At the Nymphaeum Bivium there have been many new developments. The opus spicatum floor is now definitely cut not only by the odd piers that can be seen in the basin, but salso by the basin wall. The floor also shows traces of having been cut, perhaps for light wooden walls that occupied the basin after it lost its function in the early medieval period. Jonathan’s team have also got back to the nymphaeum wall, from where wall plaster has now been recovered, as well as the edges of a possible first phase’s water basin. We are hoping to get Ana down here shortly to make an impact on understanding the decoration, and perhaps the phasing of some extremely complex walls. A number of distinguished visitors have made it to site this week. Yesterday we enjoyed the aimiable company of Chris Smith, director of the British School of Rome, who (almost) got rained upon (see above with the German team). Today we were visited by the team of Yoshiki Hori from Japan, who is lazer scanning the cardo, next to our excavation, with some impressive equipment, and by Valerie Higgins and Jens Koehler from the American University. Finally Simon Malmberg came down from the Swedish Institute, and enjoyed a lively discussion with our team until dusk. Such distinguished visitors bring us valuable motivation for the final phase of the campaign – when so much remains to be done.